In my 50-word #ifihadglass application essay, I wrote that I would, among other things, "record mudpit crossings during a 50-mile ultramarathon." At that point, I had run a dozen road marathons and several difficult trail events—including a trail marathon with a 3,900-foot elevation change and a pair of 50K (31-mile) ultras—but a full fifty miler would be 19 miles further than anything I'd ever run before. I treated my application as a promise, though, and resolved to run the Dances With Dirt 50-mile trail run in Hell, Michigan when I was accepted as a Google Glass Explorer. I'd been running Dances With Dirt for a decade, participating in the wild 5-person, 100-kilometer relay race. In that event, runners each take three legs of 2 to 6 miles in length (about 12 miles in total by day's end). One runner heads off into the woods while the other four pile into the team vehicle—which is usually festooned with outlandish decorations—and drive to the next exchange point, where the first runner will pop into view from the edge of a forest or crest of a hill and tag the next teammate into action. 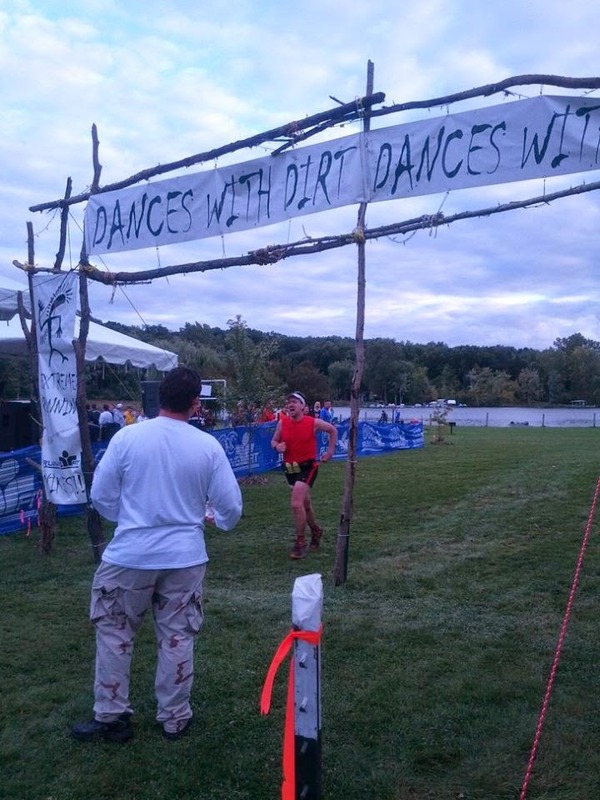 Five years ago, I took more of an interest in the ultra runners, who started in the predawn darkness and ran as a team of one through the same mud, sand, rivers, poison ivy, fields, and hills as the relay teams. Over the next few years, what I had once dismissed as masochistic insanity gradually became a fascination, then an obsession: could I possibly put myself to that kind of test? In 2011, I resolved to run a "baby ultra," the 50K. At just five miles longer than a traditional 26.2-mile marathon, it was certainly something I felt capable of completing, although I knew it would be a physical challenge like none I had attempted before. I created a six-month training plan, scheduling first a spring half marathon, then a summer trail marathon, then a fall 50K at Dances With Dirt. I joined a group of ultrarunners in the area, going on occasional training runs with them and getting coached by a runner who worked for Running Fit, the shoe and running apparel store behind Dances With Dirt and many other local races. 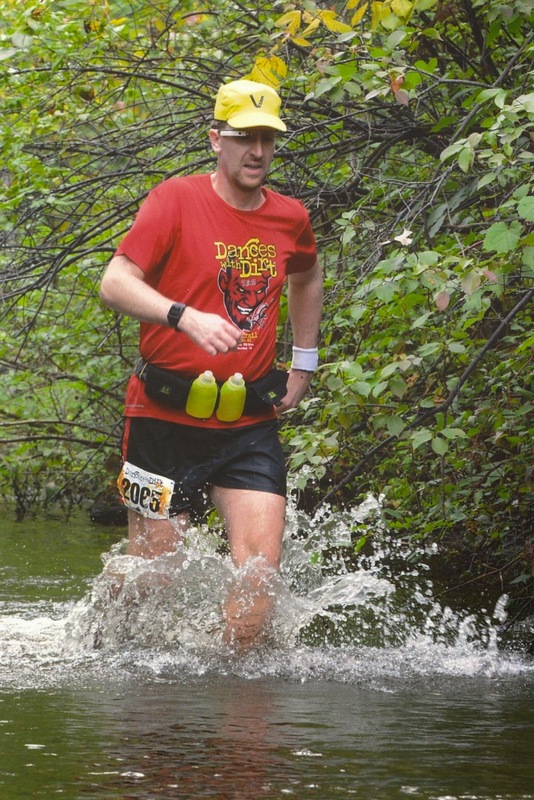 I eventually completed my first 50K in Hell that September, as well as a second (albeit slower) 50K the following spring at the plainly-named Trail Marathon. Pleased though I was with this milestone, my #ifihadglass pledge was going to require a bit more preparation. My confidence was bolstered by the friends I began to make in ultrarunning circles, many of whom ran distances of 100K, 100 miles, or longer (no matter how far you go, how strong you are, how faster you are, there is always someone who is better, stronger, or faster than you!). If these men and women could run those ridiculous distances, surely I could add an extra 19 miles to my longest distance, given time and training. I received my Glass in July, by which point I'd also purchased a FitBit One; I began running with both those gadgets, as well as my iPod Nano and a digital watch (which I'd swap out for a Basis band fitness and activity tracker by race day!). I was finally starting to become an "augmented runner"—the moniker I'd come up with for myself when I'd registered for a gmail account in order to complete my #ifihadglass application. I arrived at the starting area close to an hour early, giving me time to pick up my bib number and timing chip, take my drop bag to the designated location, and get all my gear in order. Once I had done that and was milling about the start, I recognized another runner, a British man named Andrew with whom I had gone on a road trip two summers previous for a trail event in Wisconsin. We became lost in conversation, and when I eventually glanced at my Basis band (which has a clock display by default), I noticed that the race start was in five minutes. I excused myself to make a quick trip to the Port-a-John and almost missed the start because the race director's watch was evidently a few minutes ahead of mine! In my rush to get back to the starting line, I became flustered and had difficulty getting my RunKeeper app started. I also forgot to record video of the start with my Google Glass until I was through the starting chute. Once I stopped recording video, I powered my Glass unit down to conserve battery power until the sun came up. This proved a wise decision, as battery life on three of my five digital devices became a problem later in the event. The running itself went quite well. The first many miles were run in the dark, with bright circles of light from runners' headlamps bobbing up and down on the trail. The single-track trail makes it difficult for runners to spread out early on, and little groups would form for a while, pass the time in conversation, then drift apart once the trail opened up. Once the sky lightened up, I was able to pass off my headlamp and flashlight to volunteers who collected them for return to the start/finish area. The early sections were not too gnarly—the course legs with dense underbrush and fallen logs wouldn't really start up until later in the race—although the first river crossing came when the mileage was in the late teens. By mile 22, I was running a fun section in a river on my way into the town of Hell, Michigan. After a change of clothes and a stop at the aid station, I was back on my way. The bushwhacking sections seemed more heavily concentrated in the 30s and early 40s, and I hit a dark period when I walked quite a bit and swore at the mud and fallen trees. Fortunately, a work colleague and fellow runner, Randy, made the trek out to the woods and ran with me for a few miles. He and I have gone on training runs together and traveled to Cincinnati and Washington, D.C. with a third coworker to run the Flying Pig and Marine Corps marathons. His companionship on the trails helped me get through my rough patch around mile 42, and he even ran a short loop of several miles with me to help raise my spirits and encourage me to push to the finish. For this race, I carried five digital devices: a smartphone, Basis B1 band, Fitbit One, Google Glass, and iPod Nano. This was not as difficult as it might sound: because I run distance events with a fuel belt, I had a pouch in which to carry my phone, and I simply clipped my Fitbit and iPod to the elastic waistband. My Basis band felt like any other watch, and I pretty much forgot I even had Google Glass on my head—similar to the way the sensation of a pencil behind the ear quickly fades away, my body adjusted to the comfortable frames early on. 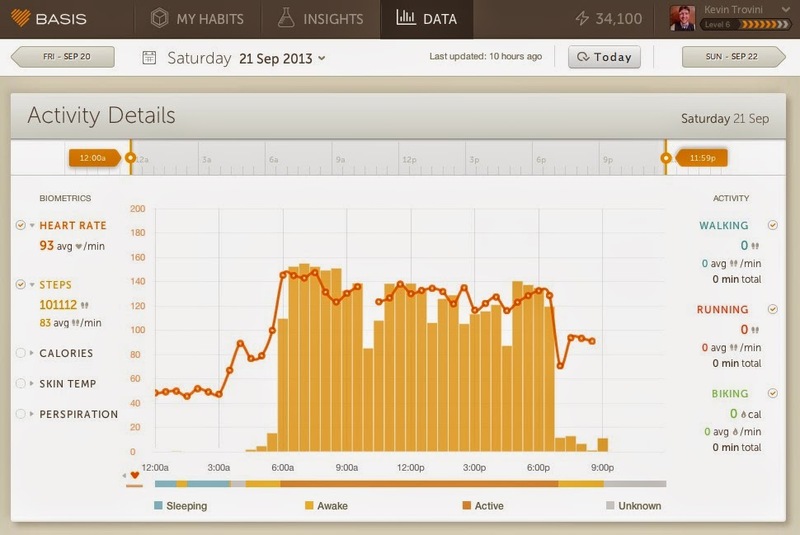 I was eager to compare the data from my Basis B1 band and Fitbit One fitness and activity trackers. I was curious to see how close their step counts would be and how similar their estimates of calories burned were. Sadly, I removed my Fitbit when I changed clothes after running through a river at mile 22 and forgot to clip it back on my dry clothes, so I lost an excellent opportunity for a comparison over a long distance. Nevertheless, the online data analysis chart for my Basis provides an impressive overview of a wide range of metrics including heart rate, step count, skin temperature, and perspiration. With a final daily tally of 101,112 steps, the chart shows a solid wall of activity between 5:30 am and roughly 6:30 pm. The heart rate data breaks once, corresponding with a dip in step count at the same time as my first major break to change out of wet clothes; I had taken the watch off at that time so I could more easily reapply sunscreen. Power consumption was a problem across devices since I was putting high demand on them over a 13-hour period. I knew that battery life would be a issue with Glass because I planned to shoot lots of pictures and video, but I didn't count on my phone running out of juice. I was trying to track my progress with a running app and neglected to account for the added power drain of drawing GPA data. When I noticed my battery had gotten down to about 20%, I shut the GPS off, but the drain from trying to maintain cell reception in the woods, along with the energy required for the bluetooth connection to Google Glass, eventually did my Nexus 4 in. Although I powered Glass off during boring stretches on which I knew there wouldn't be many photo ops, it, too, eventually shut itself off. During the final two hours, even my Basis band kept flashing a "Low Battery" warning, although it did make it to the end of the race (and I probably could have averted that matter entirely if I'd left the house with a fully-charged battery). The lesson I learned from this first ultrarunning experience with Glass and my phone was to bring along an external charger next time. One disappointment I faced was not so much a problem with my devices themselves but a consequence of running in a remote, wooded area: I could not often send or receive text messages, post status updates, or make calls due to spotty cell service. Glass draws data from a bluetooth connection to the phone, and the voice-recognition software depends on a clear signal. I often found myself frustrated when trying to send a text or upload a Facebook photo using Glass's hands-free voice commands. Even when I found a spot with reception, it would often be lost before I could complete my message, causing the entire thing to be lost and necessitating an entire new attempt. The solution—staying in one spot after finding a few bars of reception—was counterproductive to the idea of running with Glass. I imagine that I would have posted a lot more updates and pictures had I been running a road race in the city rather than a trail event in the boonies. Those concerns aside, however, running with Glass presented opportunities that I wouldn't otherwise have had and made it far easier to take pictures and receive messages. It is simply not feasible to use a cell phone to upload a picture to Facebook or send a text message while running. In addition to the awkwardness of trying to retrieve the phone from the snug confines of my fuel belt and the difficulty of trying to use a touchscreen with sweaty, muddy hands, attempting to look down at the screen while running makes it more likely to trip on a root or drop the expensive device on a rock. With Glass, I could dictate my messages (when cell reception was strong) without changing my stride at all; not only was it easier to send messages, but my running form didn't suffer, either. Furthermore, I didn't miss calls or texts from my wife the way I might have otherwise. With my phone tucked away at waist level, it can be difficult to hear the ringer or a notification tone. With Glass, I didn't miss notifications even when I was listening to music on my iPod, since the bone-conduction speaker is not muffled by earbuds. Additionally, it was nice not having to take my phone out each time I received a 15-word text; with the transparent prism above my right eye, I could easily glance up to read a message from my wife or my friend Randy without breaking my gait. Finally, I loved the ease with which I could record first-person pictures and videos, especially in places where the use of my hands was required. 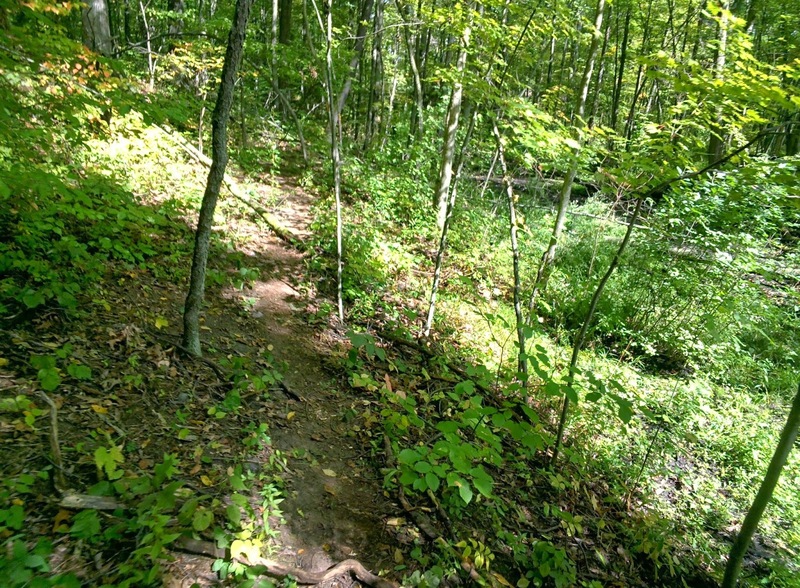 At one point, runners must climb a steep, muddy ascent that all but requires them to clamber up the hill on hands and knees. At another point, some thirty-plus miles in, my foot got stuck in thick, deep mud, and the suction actually pulled one shoe off. I had to grab a branch with one hand to keep my balance while tugging my shoe free with the other. Neither of those instances could have been recorded if I was trying to hold a phone; I was able to get video of both with Glass, however. On a beautiful day in Hell (Michigan), I completed my promise to run a 50-mile ultramarathon, my first ever, wearing Google Glass. I even got to test out some other gadgets along the way and made a few discoveries about how to better prepare for future races (better charging my devices pre-race, and bringing an external battery to charge my phone and Glass). I was able to record challenging sections of the course that I either couldn't or wouldn't otherwise and to record data on my physical activity and performance to review before future events. Compared to events in the past where I've run without cell phones or with bulky cameras, I paradoxically found that the addition of these digital technologies allowed me, in some respects, to focus more on the running itself; I was not worried about how to meet up with people supporting me and could record inspiring scenes with ease. Digital technologies or not, the event was a challenging test of willpower and endurance. GPS data, digital cameras, music, texts from the wife, and biometric information wouldn't bring me to the finish line; my legs had to carry me fifty miles on their own. Being an augmented runner, however, presented some unique rewards, too.